Add our current catalog to your order. Our Meisel Yearbook Catalog M39 for 2018-2019 has 84 full-color pages of our most current and popular products available. 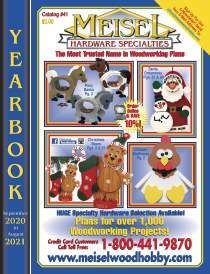 Ask for a copy to be included in your order for any project plan or hardware item. Free to customers in the USA (postal rates apply to countries outside the United States.